A very welcome sign indeed. This week is our first week living on the grounds of Catalyst Resources International as part of the staff. 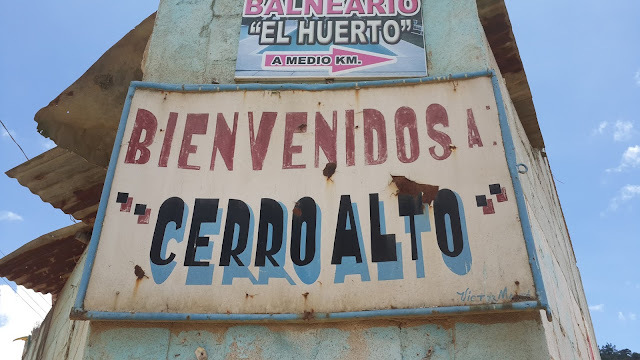 It is the first week in our new home, and also the first week of two this year that our launch church, Journey Church Cincinnati is serving as a team in Cerro Alto. This week we are working with two families as we build their new homes from the ground up. Both homes are in sight of this sign that leads to the two areas where Kellie and I have been honored to build homes over the past 3 summers, Cerro Alto and Labor de Falla. On Monday we pulled up to this now familiar fork in the road and I smiled as I realized that both paths were equally worn, and we have travelled them both (yes, nod to Frost). My mind flips through a synapsed photobook of the families that we have come to know deeply. In fact, this week I have held many children in my arms that now rest their heads on pillows, tucked in a bed, sheltered by a roof, and securely locked behind a door... and I am eternally grateful to have been a small part of this story. This story that is God's story. I am no great man. I will never be. I do not aspire to be. I want to be a man that is patient and kind with his family, who aggressively seizes life by the reigns of his belief. I want to love big, and live extravagantly. I want to cut boards, play with kids, unite families, and leave this world fully spent. I mean... I want to live a life that gives, that teaches, that embraces the full meaning of who God created us to be. I want to walk big in His story. He doesn't need me to get the job done, but I sure need Him to understand what it means to live fully. The first time I encountered the people of Guatemala, I found myself hiding in a dusty ally corner on my knees in tears. I was broken by the stark contrast of the poverty of my soul silhouetted by the fulness of life that shined from the family that would live in the house we labored together to build. This week marks the arrival of a destination that was began in my soul at that moment. This week I work alongside members of that family. I am overwhelmed by the joy that continues in my soul, and so thankful that God broke my life on that dusty hillside. I came that day to build a home, but the real construction began as the hard ground of my heart was split open by the pick-axe of truth. I wanted beyond anything to live a life that demonstrated my belief in the existence of an omnipotent God. Here we are. It is astounding. It is amazing. It is nothing less than a miracle. I pray that we never forget this journey. These steps that have brought us this far. Like a broken in pair of boots that stir the dust on a familiar path, may my soul fit with a deep felt peace into this place. This weekend is our first preview Sunday for Journey Church Guatemala. I will be sharing with our congregation the mission and vision of our gathering as we pour everything we have into connecting people to Christ and the Church. I ask you to pray with me that I communicate the heart of God... that I am able to convey the words in a way that changes lives. We are slowly filling our home with furniture that will allow us a place to recharge, and from where we launch big missions. We are getting our hands back into the work that began a change in our everything, and we are easing into our roles as Campus Pastor and Teacher, respectively. We also are beginning the processes of Guatemala Resident status and laying ground work for our mission to the abandoned children of Guatemala. So yes, we feel welcomed. Oh yes, we are at home. We look forward to hosting you with the world's best coffee, a toasty fire on a cool evening, and the opportunity to allow the surface of your heart to be shattered by the power found in the wise eyes of a mother filled with tears of gratitude as your heart joins hers in a wonder-filled gaze at the face of God.